The question is: does this pattern continue? To find out, we use it to find the next pair. The right hand number should be 17 + 12 = 29, the left-hand 29 + 12 = 41. Now 412 = 1681, and 292 = 841, so 412 = 2× 292 - 1. Repeating the process gives 41 + 29 = 70 and 70 + 29 = 99. It is easy to check that 992 = 2×702 + 1. So 992/702 = 2 + 1/702. In other words, the difference between the square root of 2 and the rational number 99/70 is approximately of the magnitude 1/702. (You can check this with your calculator). The essential discovery here is that, although it is established that the square root of 2 is not a rational number, we can by the recipe find a rational number as close as you like to the square root of two. This is sometimes expressed as “there are rational numbers infinitely close to the square root of 2” but that’s not really a helpful way of putting it. It’s better to think of a sort of game - you name a small number, say, one millionth, and I can find a rational number (using the table above and finding the next few sets of numbers) which is within one millionth of the square root of 2. However small a number you name, I can use the recipe above to find a rational that close to the square root of 2. Of course, it may take a lifetime, but the method is clear! Now, Zeno says, there is no end to this sequence! We can go on forever dividing by 10! So, Zeno concludes, Achilles has to cover an infinite number of smaller and smaller intervals before he catches the tortoise. But to do an infinite number of things takes an infinitely long time - so he’ll never catch up. We should emphasize that the above discussion of intervals, instants and so on was not the response of the Athenians to Zeno. Only with later work by Eudoxus, Euclid and Archimedes did the way to deal with these small quantities gradually become apparent. Zeno’s contribution was that he initiated the discussion that ultimately led to the calculus. In fact, according to Bertrand Russell (History of Western Philosophy) Zeno taught Socrates the Socratic method-the method of seeking knowledge by systematic question and answer. Unhappily, Zeno’s approach did not win him powerful friends, and “he finally lost his head for treason or something of the sort” (Bell, Men of Mathematics). 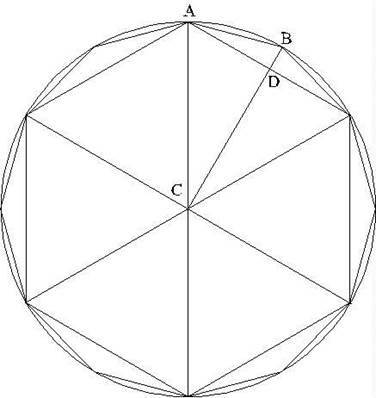 Having found CD, we can find DB since CD + DB = CB = 1, that is, DB = 1 - ½×sqrt3. 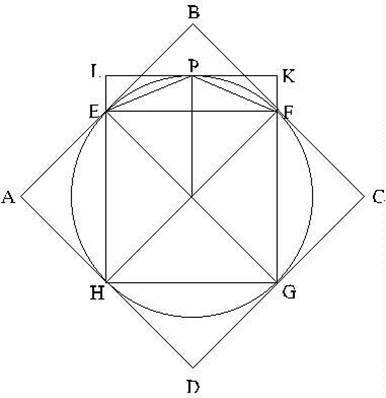 So we know the two shorter sides of the right-angled triangle ADB, and we can find the hypotenuse using Pythagoras again. 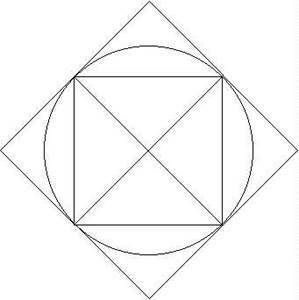 The total area of the square is equal to the total area of the 4 triangles, which is 4 times ½×h×b, or ½×h×4b. 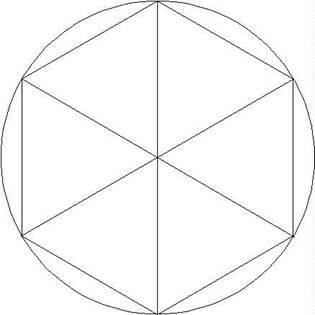 Notice that this is the area of a long thin triangle, with height equal to the distance h from the middle of the side of the square to the center of the circle, and base equal to the perimeter length 4b of the square.